So, you're a new client. Maybe you are new to Meadowbrook, or maybe its been a while since your last massage. Perhaps this is your very first Reiki experience. We are dedicated to making each of your visits comfortable, relaxing, and all about you! We care about the health, happiness and well being of our clients. Thank you for making Meadowbrook your trusted choice. We look forward to welcoming you warmly with courtesy, respect, and a friendly smile. Are you pregnant? Have your OBGYN fill out this form HERE. Did a friend refer you to Meadowbrook? Be sure to write their name on your sheet under "Referred By". You will be treated with respect and modesty at all times. You may choose between a seated massage chair or massage table (lying down). Best to remove all jewelry, glasses, and possibly even contact lenses. We are not responsible for anything lost, stolen or damaged. Please silence your mobile phone and devices to avoid interruption. All of our services can be done with the client fully clothed. It is entirely up to the client's level of comfort as to what they are most comfortable wearing during treatment. Loose, comfortable clothing without metal is best, (metal interferes with the body's flow of energy); denim jeans are best avoided. Proper draping methods are used at all times, so that only the area being worked on at that time is uncovered. Private areas are NEVER exposed nor are they worked on. Services can be paid for before or after the session. We accept cash, credit, check. All services subject to Geauga County sales tax and is not included in menu price. Clients under the age of 18 must have written consent from a parent/guardian prior to service. 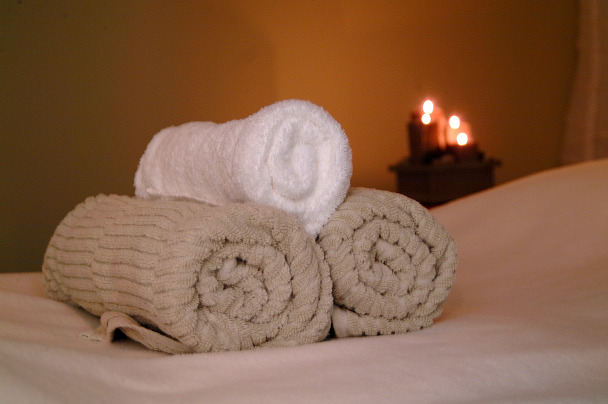 Our cozy studio offers complimentary warm towels, and (optional) warm stones and heated massage table.